Babies require a lot of stuff, especially when you need to travel with them. While you have to think about diapers, clothes, blankets, and toys, you also have to think about where the baby will sleep. You don’t need any more hassle when traveling, so luckily there are a lot of options available travel cribs that won’t break the bank. With so many styles and varieties to choose from, knowing what suits your needs best can be difficult. Don’t worry: We have broken down the ins and outs of some of the best travel cribs on the market for you here. The obvious reason to buy a travel crib is to provide a place for your baby to sleep while you’re away from home. Trips can be stressful enough without having to deal with a baby who hasn’t had adequate sleep. You need to have a safe and comfortable place to put your baby to bed when they can’t be in their own bed. Portable cribs have useful functions other than travel too. Travel cribs can offer convenience for families that live in large homes, for in-home daycares, and more! There are many benefits to using a travel crib, whether you need it for travel or as a convenient place to put your baby when you’re at home. Consistent Nap Time: Keeping your baby on a schedule is one of the most important things you can do. Since nap time is such a big part of their routine, you need to make sure they don’t miss those. Otherwise, you may be dealing with an irritated and possibly inconsolable child. Travel cribs can be set up anywhere, including your kitchen, living room, or outside in the yard. Then you can put your baby down to sleep and continue on with whatever chores you have to do. Versatile: These little travel cribs or pack and plays can be used for more than just sleeping. You can put some toys in there with the baby to keep them entertained. This also helps you by keeping the baby out from under your feet while you’re cleaning or entertaining guests. Less Expensive: Little portable cribs are cheaper to buy them a full-sized model. They also don’t require the extras, such as mattresses, bedding, or bedskirts. For those on a budget, this can save them a lot of money while adding in convenience. Purpose: What will you use your travel crib for the most? Do you travel frequently or would you just like to have another option in your home other than the baby’s nursery? Will you be using the crib only for sleeping or would you like a place for baby to be able to play too? It is also important to consider how you travel – Is it usually by car or by airplane? Baby’s Age: Chances are you’ll want something different for your older baby than you would for your newborn. Is it important for you to have something that can adapt as your baby grows? Portable Bassinets: These are generally best for babies who are newborn through about three-months-old. They will be easy to fold up and won’t take up much space. They are only intended for sleeping. This type of crib would be a good option for travel by airplane because it will usually fit within the guidelines for carry-on luggage. Portable Crib With Bassinet: This option is more versatile. The bassinet can be used from birth until about three-months-old at which time it can be removed to allow a place for an older baby to nap or play. It will be foldable for transport or storage. Standard Travel Crib: This option is different from the others in that it looks like a regular crib. It differs in size and it’s foldable. This option would be a good choice for storing at grandma’s house or for use as a secondary snoozing spot. It would also be an option for a family living in a small apartment or that has other space constrictions. Keep in mind that this type of crib would not be a good option for airline travel. Multifunctional Travel Crib: This where you’ll find all the bells and whistles. Units like these will have a bassinet, a changing table, toy bar, playard, and even a newborn-specific napping spot. It will fold into a compact case for traveling or to store. In addition to being useful for baby when you’re away from home, it would also be a good option for use as a secondary crib or changing area at home. The Brica combines durability with lightweight convenience. It can be set up quickly and easily and folds with just as simply. This bassinet folds flat and is easy to store and transport and has a carrying handle to use when it’s in the folded position. It can even fit into a suitcase when it’s folded. It comes with a comfortable mattress and a fitted crib sheet. Made from mesh and breathable fabric, this bassinet allows for good airflow. The steel frame is sturdy and locks at four different points. It can also be used for parents who want to co-sleep with the baby but want a bit of a barrier for safety. The unit can also be used to transition your baby to sleeping in a crib. See the Brica bassinet in action right here. This Graco portable crib is 20% smaller than other travel cribs of its kind, which makes it ideal for taking along on the road. Its space-saving design would also be helpful for baby’s quick cat naps at home. It is lightweight enough to easily move from room to room, and it fits in small spaces. The removable bassinet has an attached hood for blocking the sun or just to give your little one a little extra coverage for sleep. When the bassinet is taken out there’s plenty of room for play. It folds compactly with the push of a button. This crib also has mesh on all sides to provide adequate airflow. The quilted mattress is softer than other comparable travel crib options. The ruffles give the crib a nicer look than other portable options as well. See the Graco Travel Lite Crib here. This Graco Pack ‘n Play would make a great option for a family that travels frequently or just wants to have an additional place for baby to sleep. It is packed with features that are designed to streamline things as much as possible for new parents. It can be used from the time you bring your baby home from the hospital up until they are ready to get on the move. For the early days, there’s a soft napper that keeps newborns snug while they snooze. It can easily flip reverse to be a handy changer with a wipe-clean surface. The napper reverses to changer side with one hand allowing the switch without having to put the baby down. When your baby is too big for the napper they can transition to the bassinet which has breathable mesh sides. When your little one outgrows the bassinet, it can be removed and the full-size playard can be used to keep him corralled and safe as he plays or naps. This Pack ‘n Play also has a toy bar that can be removed as necessary. It folds quickly and easily with the push-button fold. Once it is all folded up it can go right into the carrying case and go wherever you go! Take a look at the versatility of this Graco Pack ‘n Play here. 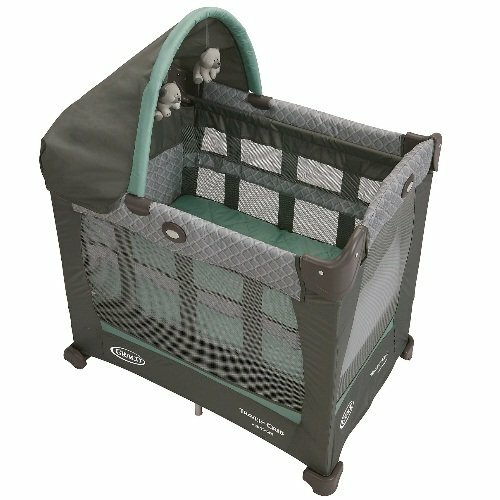 Size Recommendations: Bassinet-under 15 lbs. And unable to get on hands and knees; Playard-under 35 inches tall and unable to climb out; Napper-babies under 3 months that cannot roll over; changer-babies up to 15 lbs. 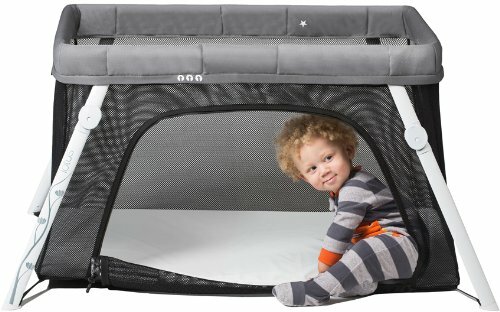 This Delta portable crib is stylish and simple. It meets or exceeds all the safety standards set by the ASTM and CPSC. It uses approximately 35% less space than a full-size crib and folds to a width of six inches for easy transport or to store when not in use. It has four casters to easily move it wherever you need it to go. The mattress support is adjustable to two different height positions to grow with baby. A one-inch thick waterproof mattress pad is included. It is free of harmful chemicals and meets rigorous safety standards. 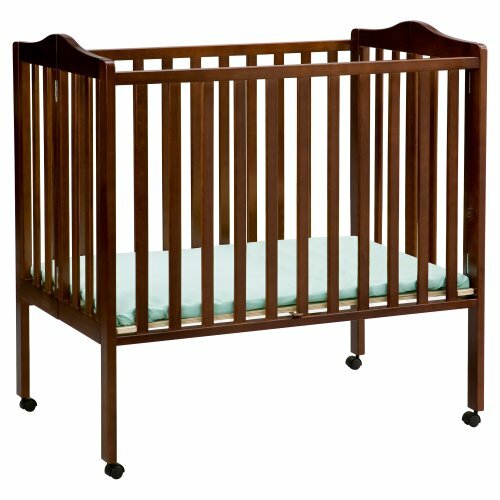 This Delta crib is made of solid wood with a glossy, non-toxic finish and comes in three finishes: white, cherry, and natural. Watch a video about safely using the Delta Children Portable Mini Crib here. Weight Recommendations: Minimum-6 lbs., maximum-35 lbs. The Lotus Travel Crib would be a good option for families frequently on the go. One of the best features is that it’s the only travel crib of its kind that can condense into a backpack and fits the requirements to be a carry-on on an airplane. It boasts a 15-second effortless set-up, making it convenient to transport, whether out and about or around your home. This travel crib also has a playard that can be zipped up to keep little ones contained or kept open to let them come and go as they please. The Lotus crib has been Greenguard Gold certified, meaning it has been rigorously tested for harmful emissions. It is made without PVC, flame retardants, phthalates, lead, heavy metals, and low VOC. It is also designed for maximum airflow and visibility. Finally, the look of this travel crib is very modern and sleek. Have a look at the Lotus Travel Crib and Portable Baby Playard here. As we’ve shown you, there are a lot of great options. 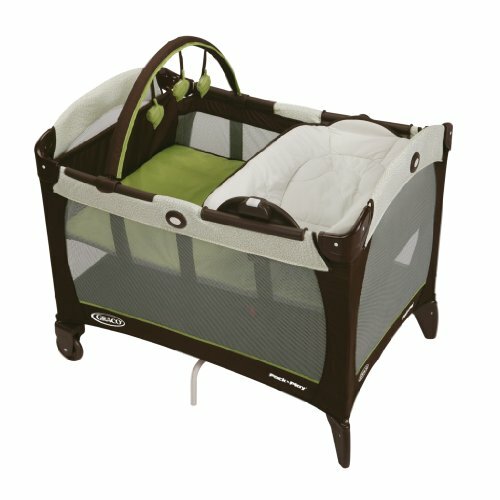 The best overall travel crib is the Graco Pack ‘n Play Playard with Reversible Napper and Changer. 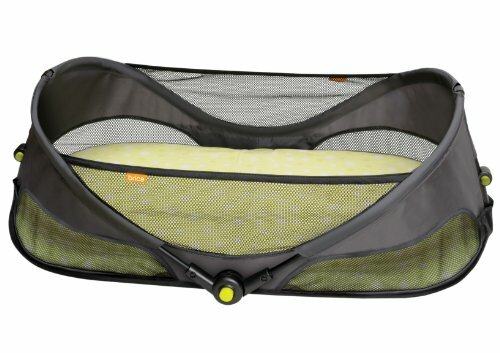 The versatility that this Pack ‘n Play has is hard to beat. It can be used from the time you bring your sweet little bundle home from the hospital up until the time they are able to start zooming around on their own. The Graco Pack ‘n Play would be a solid choice for families who are looking for a multifunctional travel crib. Thank you for visiting MyTinyTraveller.com. If our article has helped you make a decision about the best travel crib for you, please click through to Amazon using one of our ‘Buy Now’ buttons. We are an Amazon Affiliate website and we keep our website running through the small commission we receive when you purchase your travel crib from Amazon after visiting our site. There is no extra expense for you – the price is the same as if you went to Amazon directly. If you’re looking for more than the best travel crib, please review our best stroller buyers guide.